Clear to partly cloudy. Low near 60F. Winds NW at 5 to 10 mph..
Clear to partly cloudy. Low near 60F. Winds NW at 5 to 10 mph. Michael Gastelum, a St. Helena native and graduate of St. Helena High School, has transformed St. Helena Fitness after buying the gym four years ago. Michael Gastelum, owner of St. Helena Fitness, lifts weights at his Dowdell Lane facility. This photo was taken in July 2015. There are plenty of opportunities for staying fit at St. Helena Fitness, according to the fitness center's owner, Michael Gastelum. 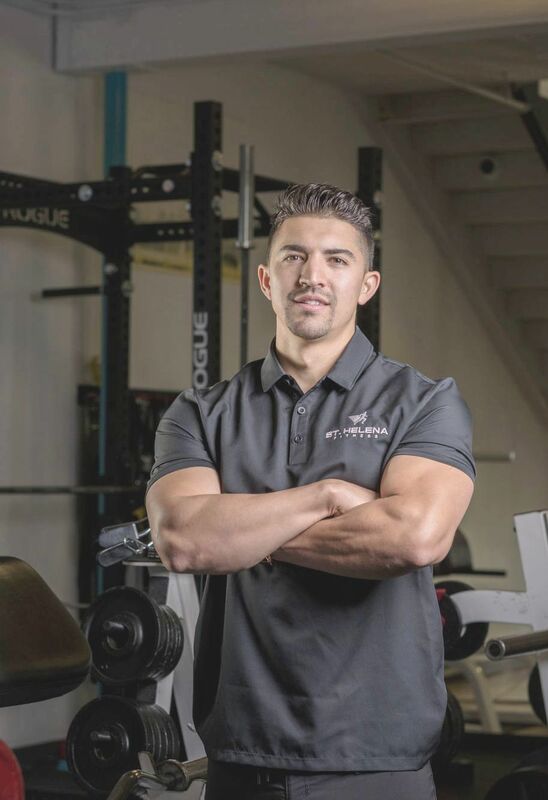 St. Helena Fitness is celebrating how it has brought members and staff together for approximately four years since current owner Michael Gastelum purchased the gym. “We’re an affordable gym that supports locals, with a friendly and fun atmosphere,” said Gastelum, a St. Helena native and graduate of St. Helena High School. St. Helena Fitness offers full strength and cardio equipment, a wide range of classes, including boot camp, yoga, body sculpting and personal training, with six certified personal trainers on staff. Gastelum said the gym’s renovation, purchase of new equipment, and positive environment among the staff and members have remade the facility. “We don’t just promote fitness. We promote personal connections and a healthy lifestyle,” said Gastelum. Joey Sova, head personal trainer at St. Helena Fitness, said Gastelum plays a large part in shaping the gym’s atmosphere. “He is very hands on, at the gym every day so he is in touch with what’s going on. Mike knows the name of almost every person who walks through the door. If there is a new member he hasn’t met previously, he will introduce himself,” said Sova. “I’m an athlete and played a lot of different club sports, including soccer. Soon after I started coming here, Michael asked me if I was interested in joining the staff. I like coming here because this gym is so calm. Everyone knows each other. If you come in without your headphones on, people will talk to you,” said Jamieson. The gym is Gastelum’s first venture into business. Gastelum got to know the gym by joining it when he returned to St. Helena in 2013. Gastelum had recently received his Master’s in Business Administration from St. Mary’s College, where he had played shortstop for the Gaels, the college’s Division I baseball team. “I talked with the owner at the time, and this opportunity came about. The gym had been here for about 17 years, but many of the machines were rundown. The gym needed a facelift and rebranding,” said Gastelum. Gastelum replaced half of the exercise machines in the gym, including new cardio machines, repainted the walls and got new carpeting. He also hired more personal trainers. “In addition, I bought an InBody machine which is a body composition analyzer, which tells you everything from your skeletal muscle mass to your body fat percentage. It helps members track their progress,” said Gastelum. The 5,000-square-foot layout now includes a cardio area, with treadmills, elliptical machines, bikes, and stairclimbers. Here members can engage in simple aerobics and High Interval Intensity Training (HIIT) workouts. There are shower and locker rooms, as well as a strength area, with dumbbells, chains, and racks. Upstairs, there are isolation machines which focus on the glutes, abs, triceps, and biceps, as well as a mat stretch area. Upstairs is also home to the studios where classes like bootcamp and gentle yoga are held. “It’s big enough so that it doesn’t feel crowded, but small enough so that you feel like you know everyone there,” said Stein. Stein said St. Helena Fitness changed how he worked out. “I used to play soccer and go to gym. I did the same routine for 19 years. The personal trainers at St. Helena Fitness taught me how to ‘super set,’ do shorter routines that have a higher impact. I have seen power (muscle) building and fat loss at a rate I have not before,” said Stein. Jessica Farrell, also a member, said she first came to the gym because she didn’t have a healthy lifestyle in terms of exercise and balance. “I got a tour with my daughter. Then Mike reached out and we talked about goals. I got started with personal training sessions. It’s now been about a year. I am doing things more independently,” said Farrell. Virginia Meyer, who works at the front desk, joined the staff after becoming a member. Meyer said she appreciated how the staff there made her feel when she first came. “I love doing the same thing for other people who walk in the door,” said Meyer. Meyer said the gym is well-equipped. This makes it easy to do workouts from weights to cardio. “We have a lot of classes available if you’re just starting out,” said Meyer. Bonnie Zimmermann, a member, said St. Helena Fitness is her second home. “I do a lot of fieldwork in Southeast Asia, specifically in Indonesia, so I need to be really strong and fit. I train three days a week. I come here because it’s the kind of place where you can feel comfortable as a woman. Everybody is encouraging you,” said Zimmermann. Zimmermann said the training routine created for her by personal trainer Jamieson involves one day of leg and core work, one day of upper body and core work, and one day of back work and core. “The staff there keep it fresh, pay attention to detail so that you do the exercises correctly, and make it fun,” said Zimmermann. “You can grab a couple of friends and have a personal training session together. It’s fun. I’ve worked with all of the trainers there. They’re all top notch,” said Farrell. Farrell added that Gastelum’s dedication to St. Helena Fitness is a quality you can feel. “Mike is a St. Helena success story. He has a connection with all of his clients. Also, the atmosphere there is nice. Everyone who comes brings something to the table. We laugh, we tell jokes. Members and staff have had a positive impact on my fitness,” said Farrell.